The URC is about to enter into the first year of its Vision 4 Life project. When I say ‘about to’ that’s obviously church speak for in 6 months. I like the idea. I think that encouraging our congregations to engage with ‘The Bible’, ‘Prayer’ and ‘Evangelism’ is a good thing but it has to go beyond that to make any difference because I’m sure if this is seen as just another bible study programme or house group then the people who usually take part in these things will take part in this and nothing much will change. Change is the goal. Transformation. OK. That sounds great. If the bible and prayer and evangelism are anything then transforming should be at the top of the list. If not I think we have missed the point. I got to have a look at some of the draft ‘bible’ material the other day. ‘The Bible’ is the first theme. My honest opinion? Disappointing. Very disappointing. For me (and that’s the only opinion I can give) the materials look far too much like every other bible study I’ve ever seen. And the bit that’s missing is the ‘transformation’. The questions that never seem to make it into bible studies ar ‘So what?’ and ‘How will this change my life?’. ‘What do YOU think this means?’ and ‘How does it help you understand your life and faith?’. Those for me are the transforming questions. I guess you might call it ‘contextual’. I’m a big fan of contextual bible study because it is about you, your understanding, your insight, your life. Academic theology is important but only if it informs how people understand their faith. Jesus did contextual all the time. He pointed to sheep, goats, mustard seeds, water, trees, wine, bread and said the Kindgdom of God is like this. People understood because they recognised the context of the stories. We don’t live in the Galilee of 2000 years ago so our context is different. OUR faith has to make sense in OUR context. That’s why churches are empty, that’s why fresh expressions of church appear. People need to make sense of their faith in their life or else is makes no sense at all. Faith stops being transforming and becomes an academic exercise. So, if V4L is going to be Visionary and For LIFE then it has to help people make the connection. 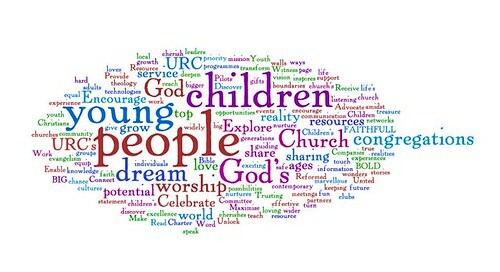 This is our children and youth work strategy visualised as a word cloud by wordle. On Friday I spent the morning at a meeting of Christian Youth Workers who are discussing setting up a network. To help us think about what the network should be and how we could describe it Neil Pratt from ICC led us through a discussion on ‘what is Christian Youth Work?’. I’ve always been a little skeptical of the term. I agree that there are youth workers who are Christian but I see little that defines youth work as Christian beyond the motivation of the worker. We ended up in a discussion about motivation, evangelism v education. For me, youth evangelism is not the same as youth work. Youth work is educational and not dependent on young people coming to faith. The highlight for me was presenting the girls with their awards and prizes. Over the year they work hard to achieve their awards and a lot of that work is unseen. I remember parents nights and displays from my days in the Boys’ Brigade and being presented with my awards was always a highlight for me. There is something very special about hearing your name called and walking up to the front to collect something you have worked very hard for. So well done girls. I was very proud to present you with your hard earned awards. I was also asked to say a few words to the girls and the adults. I used my few moments to encourage the girls to keep at it and work hard. To learn more about themselves, each other and about Jesus. I spoke to the adults about the value of volunteering. 69% of adults say they would like to volunteer to work with children but only 5% do. Those 5% are worth their weight in gold. The officers and helpers at 5th Edinburgh are brilliant. They give of their time and their enthusiasm because they love working with their girls. Many of them are young women who have been in the company from childhood and are now giving back because they know how valuable the time and energy and patience that was invested in them has been. Across the country youth clubs, uniformed organisations, sunday school and sports clubs are closing because adults don’t volunteer. If you are one of the 69% who think you would like invest in our children then please do! You may never know how precious your time could be. As someone who had adults invest in me as a child I can tell you that every moment you spend will be beyond value. I’m about to head off to Carberry Tower near Edinburgh for 24 hours to our Synod Programme Committees. On the agenda for me are Children and Communion and Safeguarding as well as working with the Children and Youth Ministry Committee on our future plans for the Synod Youth Forum and some other stuff in the pipeline that I’ll tell you more about later! iChurch is, in my humble opinion, the best idea I’ve seen in ages. then ichurch is the answer! For a one off fee of £100 you get your own website with a yourchurch.urc.org.uk address, a site that is already set up and really simple for anyone to update. It runs from the URC server so no web hosting costs or any of that website hassle. It’s a brilliant idea and one I think every congregation should take up.